IMPORTANT - READ THESE TERMS CAREFULLY BEFORE INSTALLING INVOICE MANAGER FOR EXCEL. BY INSTALLING THIS SOFTWARE, YOU ACKNOWLEDGE THAT YOU HAVE READ THIS LICENSE AGREEMENT, THAT YOU UNDERSTAND IT, AND THAT YOU AGREE TO BE BOUND BY ITS TERMS. IF YOU DO NOT AGREE TO THE TERMS AND CONDITIONS OF THIS LICENSE AGREEMENT, EXIT THIS PAGE WITHOUT INSTALLING THE SOFTWARE. This EULA is a legal agreement between you (either an individual or a single entity) and the publishers of INVOICE MANAGER FOR EXCEL, UNIFORM SOFTWARE LTD, for use of this software and may include associated media, printed materials and any "online" or electronic documentation (the Software). By installing the Software, you agree to be bound by the terms of this EULA. If you use this Software on a trial basis prior to purchase, then additional restrictions govern its use. The Trial Version is fully functional, but is intended to be used only for evaluation purposes and whilst you may create your own database files you will have access to your database files only for a certain period, as detailed on the publisher's web site (https://www.INVOICINGTEMPLATE.COM). Thereafter, you will be able to access the database files created by you only upon your purchase of the full version of the Software product license. Upon your purchase of the full version of the Software product license, the restrictions in this paragraph (Trial Version Software Limitation) shall no longer apply, but you acknowledge that your use of the full version of the Software product license will be conditioned on your agreeing to the terms of the Software License Agreement accompanying the full version of the Software product license. UNIFORM SOFTWARE LTD (the Publisher), grants you a non-exclusive, non-transferable license to use the Software with which this license is distributed ('the Software'), including any documentation files accompanying the Software on the computers for which you have purchased the licenses. Each computer running the software requires its own unique license key. The primary user of the computer on which the software is installed may make a second copy for his or her exclusive use on a portable computer. Email support@INVOICINGTEMPLATE.COM to request a license key for your laptop computer (provided the terms and conditions are met). You have no ownership rights in the Software. Rather, you have a license to use the Software as long as this License Agreement remains in full force and effect. Ownership of the Software, Documentation and all intellectual property rights therein shall remain at all times with UNIFORM SOFTWARE LTD. Any other use of the Software by any person, business, corporation, government organization or any other entity is strictly forbidden and is a violation of this License Agreement. The Software and Documentation contain material that is protected by United States Copyright Law and trade secret law, and by international treaty provisions. All rights not granted to you herein are expressly reserved by INVOICINGTEMPLATE.COM. You may not remove any proprietary notice of INVOICINGTEMPLATE.COM from any copy of the Software or Documentation. You may not publish, display, disclose, rent, lease, modify, loan, distribute, or create derivative works based on the Software or any part thereof. You may not reverse engineer, decompile, translate, adapt, or disassemble the Software, nor shall you attempt to create the source code from the object code for the Software. You may not transmit the Software over any network or between any devices, although you may use the Software to make such transmissions of other materials. You may transfer the Software to other computers you own as long as you only use one license key on one computer at a time. You acknowledge that the Software contains proprietary trade secrets of INVOICINGTEMPLATE.COM and you hereby agree to maintain the confidentiality of the Software using at least as great a degree of care as you use to maintain the confidentiality of your own most confidential information. You agree to reasonably communicate the terms and conditions of this Software License Agreement to those persons employed by you who come into contact with the Software, and to use reasonable best efforts to ensure their compliance with such terms and conditions, including, without limitation, not knowingly permitting such persons to use any portion of the Software for the purpose of deriving the source code of the Software or defeating the Key. 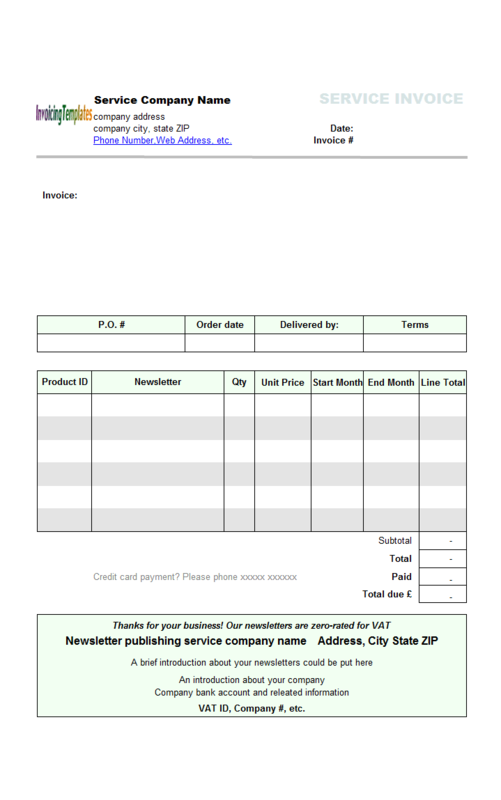 INVOICINGTEMPLATE.COM WARRANTS FOR A PERIOD OF THIRTY (30) DAYS AFTER PURCHASE THAT THE SOFTWARE WILL OPERATE SUBSTANTIALLY IN ACCORDANCE WITH THE DOCUMENTATION. SHOULD THE SOFTWARE NOT SO OPERATE, YOUR EXCLUSIVE REMEDY, AND INVOICINGTEMPLATE.COM'S SOLE OBLIGATION UNDER THIS WARRANTY, SHALL BE AT INVOICINGTEMPLATE.COM'S SOLE DISCRETION, CORRECTION OF THE DEFECT OR REFUND OF THE PURCHASE PRICE PAID FOR THE SOFTWARE. ANY USE BY YOU OF THE SOFTWARE IS AT YOUR OWN RISK. THIS LIMITED WARRANTY IS THE ONLY WARRANTY PROVIDED BY INVOICINGTEMPLATE.COM REGARDING THE SOFTWARE. EXCEPT FOR THE LIMITED WARRANTY ABOVE, THE SOFTWARE IS PROVIDED 'AS IS'. TO THE MAXIMUM EXTENT PERMITTED BY LAW, INVOICINGTEMPLATE.COM DISCLAIMS ALL OTHER WARRANTIES OF ANY KIND, EITHER EXPRESSED OR IMPLIED, INCLUDING, WITHOUT LIMITATION, IMPLIED WARRANTIES OF MERCHANTABILITY AND FITNESS FOR A PARTICULAR PURPOSE. 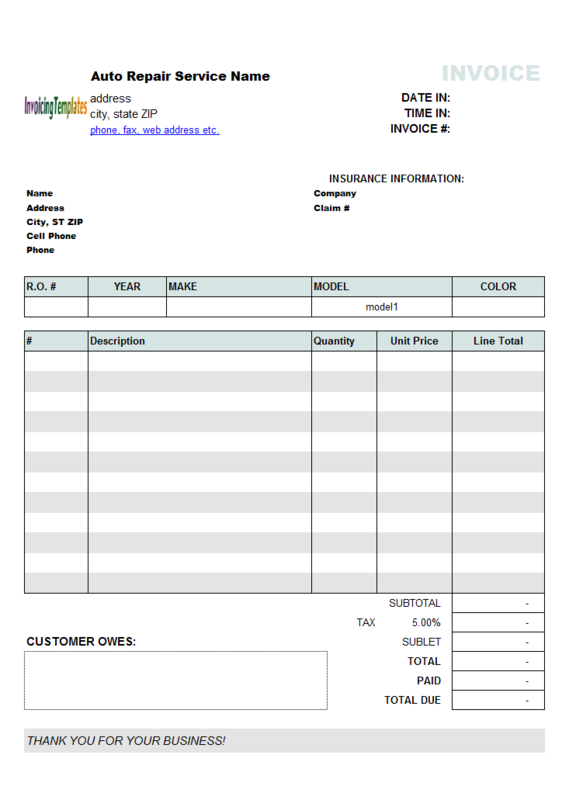 INVOICINGTEMPLATE.COM DOES NOT WARRANT THAT THE FUNCTIONS CONTAINED IN THE SOFTWARE WILL MEET ANY REQUIREMENTS OR NEEDS YOU MAY HAVE, OR THAT THE SOFTWARE WILL OPERATE ERROR FREE, OR IN AN UNINTERRUPTED FASHION, OR THAT ANY DEFECTS OR ERRORS IN THE SOFTWARE WILL BE CORRECTED, OR THAT THE SOFTWARE IS COMPATIBLE WITH ANY PARTICULAR PLATFORM. SOME JURISDICTIONS DO NOT ALLOW THE WAIVER OR EXCLUSION OF IMPLIED WARRANTIES SO THEY MAY NOT APPLY TO YOU. THIS WARRANTY GIVES YOU SPECIFIC LEGAL RIGHTS AND YOU MAY ALSO HAVE OTHER RIGHTS THAT VARY FROM STATE TO STATE. IN THE EVENT THAT ANY OF THE ABOVE LIMITATIONS OR EXCLUSIONS IS HELD TO BE UNENFORCEABLE, THE PUBLISHER'S TOTAL LIABILITY SHALL NOT EXCEED THE AMOUNT OF THE LICENCE FEE YOU PAID. IN NO EVENT WILL INVOICINGTEMPLATE.COM BE LIABLE TO YOU OR ANY THIRD PARTY FOR ANY INCIDENTAL OR CONSEQUENTIAL DAMAGES (INCLUDING, WITHOUT LIMITATION, INDIRECT, SPECIAL, PUNITIVE, OR EXEMPLARY DAMAGES FOR LOSS OF BUSINESS, LOSS OF PROFITS, BUSINESS INTERRUPTION, OR LOSS OF BUSINESS INFORMATION) ARISING OUT OF THE USE OF OR INABILITY TO USE THE PROGRAM, OR FOR ANY CLAIM BY ANY OTHER PARTY, EVEN IF INVOICINGTEMPLATE.COM, HAS BEEN ADVISED OF THE POSSIBILITY OF SUCH DAMAGES. INVOICINGTEMPLATE.COM'S AGGREGATE LIABILITY WITH RESPECT TO ITS OBLIGATIONS UNDER THIS AGREEMENT OR OTHERWISE WITH RESPECT TO THE SOFTWARE AND DOCUMENTATION OR OTHERWISE SHALL NOT EXCEED THE AMOUNT OF THE LICENSE FEE PAID BY YOU FOR THE SOFTWARE AND DOCUMENTATION. BECAUSE SOME STATES/COUNTRIES DO NOT ALLOW THE EXCLUSION OR LIMITATION OF LIABILITY FOR CONSEQUENTIAL OR INCIDENTAL DAMAGES, THE ABOVE LIMITATION MAY NOT APPLY TO YOU. THIS SOFTWARE IS NOT FAULT TOLERANT AND IS NOT DESIGNED, MANUFACTURED, OR INTENDED FOR USE OR RESALE AS ONLINE CONTROL EQUIPMENT IN HAZARDOUS ENVIRONMENTS REQUIRING FAIL-SAFE PERFORMANCE, SUCH AS IN THE OPERATION OF NUCLEAR FACILITIES, AIRCRAFT NAVIGATION OR COMMUNICATION SYSTEMS, AIR TRAFFIC CONTROL, DIRECT LIFE SUPPORT MACHINES, OR WEAPONS SYSTEMS, IN WHICH THE FAILURE OF THIS SOFTWARE COULD LEAD DIRECTLY TO DEATH, PERSONAL INJURY, OR SEVERE PHYSICAL OR ENVIRONMENTAL DAMAGE.